Matt's pretzels from yesterday's post were more than just a tasty treat last holiday season, they were a special memory for me. It was not exactly a holiday memory - but these big puffy soft hot pretzels brought back memories of my own childhood attempt at pretzels, straight out of Cricket Magazine - of which I was an avid reader. I still have them all - from Volume I Issue I on up for about 5 years. I am saving them to share with the Munchkin when he is old enough - and I hope that he finds as much enjoyment in them as I did. 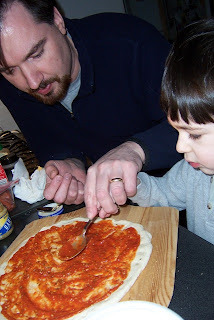 In the meantime, we are starting to share the kitchen with the Munchkin, giving him more and more of a role in "helping" as we cook, create, and consume, starting to build his own Tastebud Memories. I wonder, when he grows, what taste or smell will bring him back to his childhood? I am sure it won't be the same as mine, or Matt's or Bobby's. What is your tastebud memory?